Prints by James McNeill Whistler and His Contemporaries, National Gallery of Art, Washington, 1995, as The Absinthe Drinker. 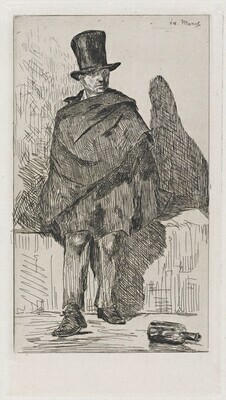 Manet/Velázquez, La manière espagnole au XIXe siècle [Manet/Velázquez, The French Taste for Spanish Painting], Musée d'Orsay, Paris; The Metropolitan Museum of Art, New York, 2002-2003, no. 167, fig. 9.29 (shown only in New York).